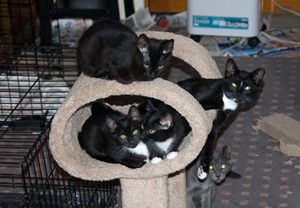 These kittens love attention, and all four are ready for homes. Photo credit: Community Cat Coalition. With input from our friends at the Community Cat Coalition, each week we will be featuring a cat that needs a loving home. Hoppy, Tiny, Sweetie and Sister are ADORABLE kittens! Originally trapped as tiny feral babies, they were young enough to totally turn around and become sweet, friendly, normal little kittens. The boys are clowns, the girls (while adventurous) are more “dignified." All four love attention, and all four are ready for homes. While the boys would be a delightful pair, they do not have to go together; the girls stick together all the time, and we think they would do best going to one home. Contact Nancy if you’d like to meet them; seeing them in their foster home and talking to the foster who knows their personalities might be the best way for you to choose the one who is right for you! For more information, email nwahl@netzero.net. The Community Cat Coalition (CCC) was formed in November 2011 when a few people realized that if rescue groups, shelters, and independent rescuers work together, we can make a positive change in the lives of our community cats. The CCC is an all volunteer organization . All funds go toward the efforts of TNR (Trap-Neuter-Return) – paying for spay/neuters, vaccines, medical care for injured/sick free roaming cats, or the costs of fostering the kittens who are removed from the sites. Our goal is to educate interested people in our area so there is a common understanding of what a community cat is (they may be feral, semi-feral, or abandoned/stray tame cats – any free roaming cat) and how to care for them. The community cats belong to no one person – they belong to all of us. This concept is taking hold worldwide, and we CAN make a difference right here, in our communities. We provide classes in basic TNR, (Trap-Neuter-Return) open to the public and all shelters/rescues. We give people the tools to do TNR safely and effectively, and we also simply involve them in the care of the community cats. We also offer classes on related topics, such as care of bottle babies, taming feral kittens, and how to do a barn relocation. All classes are free. We are excited to be in the middle of this movement - TNR and care of the community cats is a worldwide phenomena and is rapidly gaining in popularity. We do not currently have a website, but post frequent stories/information on our Facebook page. http://www.facebook.com/CommunityCatCoalitionWa. We have established an email account in order to provide a way for anyone to reach out and contact us with questions (communitycatcoalitionwa@gmail.com).